There are certain comic book characters whose characterizations are so canonically static that it becomes difficult to imagine them ever changing in a significant way. Take Galactus for example. Since he was first introduced in Fantastic Four #48, he’s has done little else than threaten to devour planets. In issue #2 of Al Ewing and Kenneth Rocafort’s Ultimates, though, Galactus went through the most drastic transformation in the character’s 50-plus year history. Tasked with preventing Galactus from destroying the world, the Black Panther, Monica Rambeau, and Blue Marvel realize that they can use the same technology that gave birth to the devourer at the beginning of time to essentially reverse his polarity and recreate him as Galactus: The Lifebringer. In this week’s Ultimates 2, we learn just what Galactus has been planning to do with his newfound purpose in life, and get a deeper look into the cataclysm that both ended his original universe and created the monster most people know him as. Before there was Galactus the Devourer or Galactus the Lifebringer, there was Galan of Taa, a scientist much like Reed Richards or Black Panther who sought the uncover the secrets of the galaxy. As is often the case with fictional super scientists, Galan eventually found himself confronted by the imminent destruction of reality, a problem he believed could be prevented through cunning. In the final moments of Galan’s life—as he and the crew of his spaceship realized that there was nothing to be done about the universe’s end—Galan randomly meets the Sentience of the Universe, an embodiment of his reality’s life. Rather than accepting that they’re both about to die, the two merge together to become a new being and, as the universe crunches in on itself, an egg is formed that eventually cracks, causing the big bang and Galactus’ birth. Since his rebirth, Galactus has most chiefly concerned himself with Eternity, the abstract embodiment of the current universe’s consciousness, who was imprisoned in the aftermath of Secret Wars. Like most of the intangible cosmic beings in Marvel’s books, Eternity usually exists on a plane beyond the comprehension of living beings and seldom bothers to get directly involved in the goings-on of the physical plane. Because a number of alternate universes were destroyed during Secret Wars, a cosmic power imbalance left Eternity vulnerable and Galactus and the Ultimates thwarted a threat that targeted him. Though he was able to save it once, the fact that anything was able to threaten Eternity gives Galactus a renewed sense of purpose—and the desire to seek out Ego the Living Planet, one of the few other beings like himself that exist. If there are forces that can manage to harm Eternity, Galactus explains to an incredulous Ego, then their universe can never truly be said to be safe. As the Lifebringer, Galactus explains, it’s his job to ensure that whatever else is out there is held at bay. But he needs Ego’s help and things get weird as hell. In one of the strangest twists of fate, Galactus transforms Ego, the Planet, into Ego the... person(?) with a planet for a head, and introduces him to a new team of cosmic-level weirdos who have sworn to protect Eternity. As serious as a lot of comic books take themselves today, it can be easy to forget that once upon a time, writers weren’t afraid to introduce characters that were absolutely batshit. When he was first introduced, Galactus was quite literally a giant purple man who ate planets like apples thanks to the help of an employee who flew through space on a silver surfboard. Like the Phoenix, Galactus’ original absurdity gave way to a kind of larger-than-life gravitas, which robbed the character of any absurdity in favor of making him a generic world-ending villain that heroes would periodically team up to defeat. 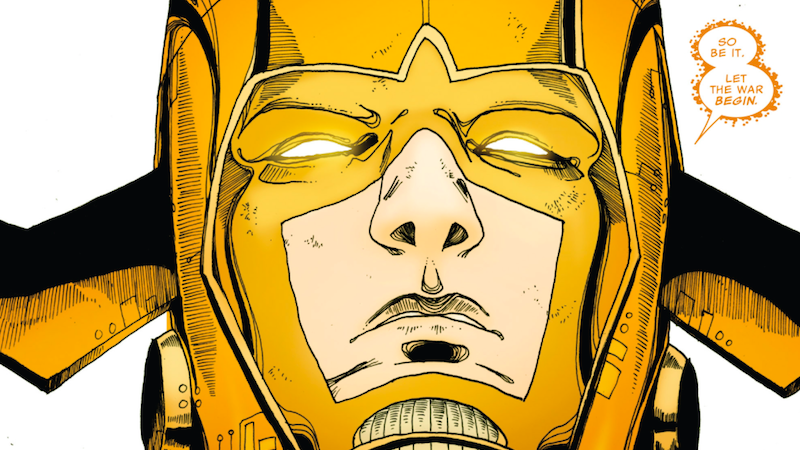 In a delightful way, Ultimates 2 is breathing new life into Galactus by making him weird again.